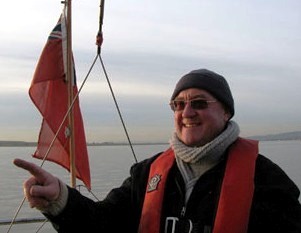 Concern is growing for a missing sailor after a 12 ft catamaran was found drifting in the Thames Estuary on Saturday. The white New Cat 12 was discovered 27 miles north east of the North Foreland at about 8 pm with no one on board. Coastguards found a black North Face rucksack on board containing items of clothing, maps and a small quantity of cash, but no clue to identity. It has now been towed into Ramsgate Harbour. If you have any information please call 101 for Kent Police and quote reference 26-1235. Read more at Kent Online. 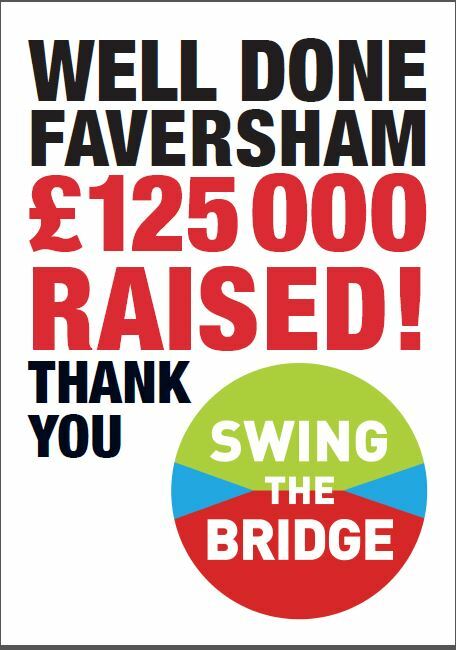 Faversham Creek Trust has succeeed in raising its target of £125,000, the contribution required by Kent County Council to proceed with installing a new swing bridge at the head of the Creek. This means that all the plans for marine activities in the Basin can go ahead. At the last MSBA business meeting, Captain Ian Clark reminded boaters to keep 150 metres away from the LNG terminal. Otherwise, proximity alarms go off and mayhem ensues, potentially resulting in a fine! 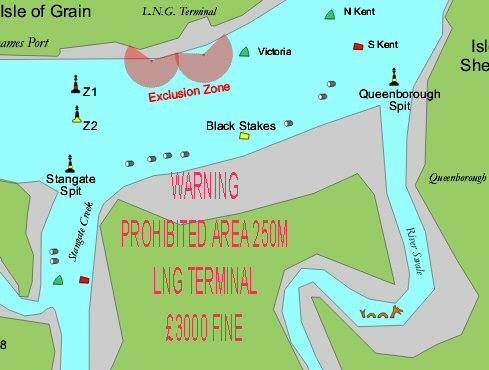 Curiously, the Notice to Mariners states that the exclusion zone increases to 250m if a tanker is berthed, but only if your vessel is >50m long or you are exceeding 7.5 knots through the water. Run, don’t walk! 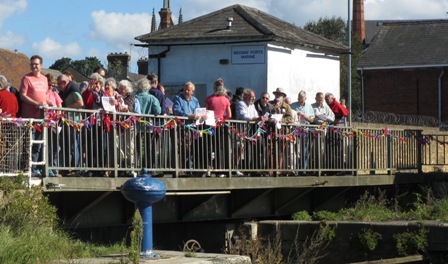 Get the latest (“October”) issue of Yachting Monthly to read a two page article by Nick Ardley, who spoke at our Medway/Swale Boating Conference, describing in his unique dream-like style an idyllic sailing trip through the Swale with insights into its industrial past. Did you know there used to be a link between the Swale and Stangate Creek? 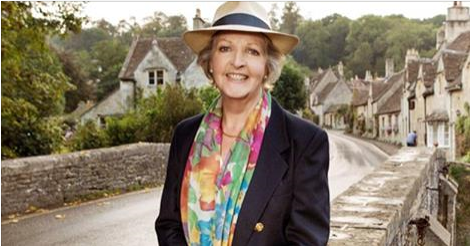 Medway Yacht Club will be featured as part of Penelope Keith’s Hidden Villages programme to be aired on Tuesday 22nd September at 9pm on More Four. 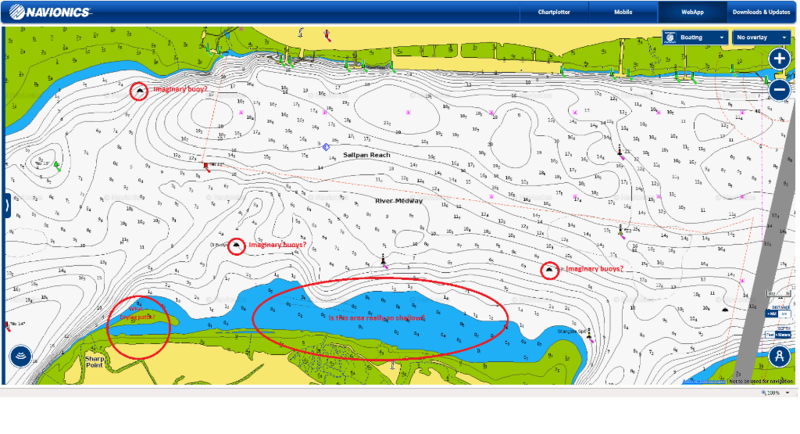 UPDATE: The specific errors shown above have been reported to Navionics and have been corrected, though the spurious rocks litter the foreshore… Still no explanation has been forthcoming. 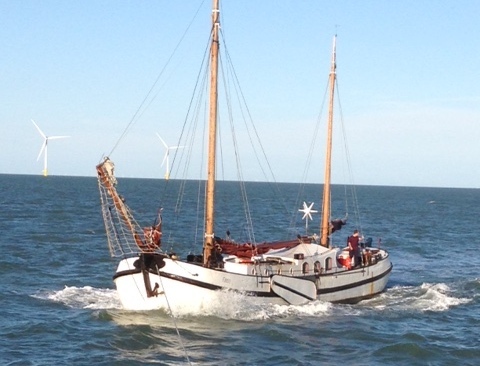 On Saturday 12 September, the Sheerness all-weather lifeboat went to the aid of this 20 metre Dutch barge “Friso” that had broken down and was anchored south of the Kentish Flats wind farm. The barge, with six persons on board, was towed to Queenborough Harbour.. Even if you’re not a CA member, you’re welcome to attend the fascinating evening “Winter Warmer” talks organised by the Kent Section of the Cruising Association. On 8 October it’s “Girl’s Guide to the Southern Ocean” with Linda Crew-Gee, who recently completed one of the toughest sea passages on Earth. Linda will tell you the story what it was like to sail on an old ship, to be at sea for 30 days in tough conditions, with no communications… what she learned about our planet, the sea and the life. Across the Southern Ocean and via Cape Horn on “Tecla”, a 100-year-old Dutch gaff ketch, this is as traditional as it can get. The talks are at 8pm at the Dog & Bear, Lenham, ME17 2PG. We recommend going earlier to enjoy the great food. Call 01622 858219 to book a meal. In addition to the exceptional high tide levels there will be increased tidal flows.